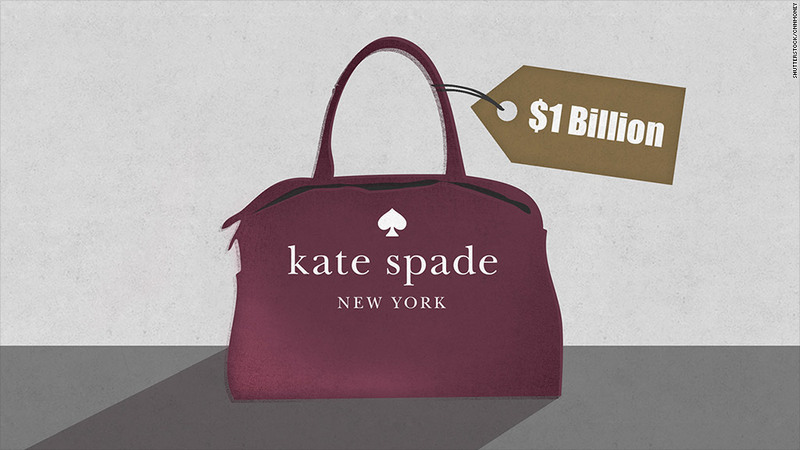 Kate Spade is on track to be a billion dollar business by the end of the year. Kate Spade just fired one heck of a good looking shot in the "handbag wars." The brand -- known for its bright colored handbags and accessories -- reported huge sales growth Thursday that sent the stock soaring 18%. In fashion terms, Kate Spade (KATE) is like the fresh-faced teenager on the runway. The brand has the buzz among consumers (and investors) while bigger rivals Coach (COH)and Michael Kors (KORS) look a season behind. "Kate is one of our favorite investment ideas," says Ike Boruchow, a managing director at Sterne Agee who covers the retail sector. 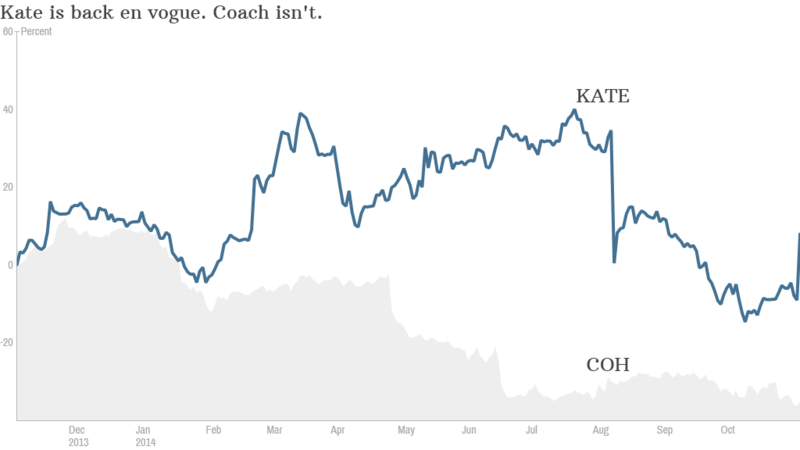 "We have hold [ratings] on Coach and Kors and a buy [rating] on Kate." In another sign of its rising profile, Kate is on track to be a billion dollar brand by the end of the year. It's gone from being a small handbag retailer founded in 1993 to a total lifestyle brand that does everything from dresses to dishes. Investors are salivating about the potential for further growth. "It's not going to be the next Kors," argues Burochow. "But if the business can double in the next three or four years, the stock could be up 50% over that time." By the numbers: Compare that to Kate's competitors: Coach is in the midst of a total redesign. It recently brought in British designer Stuart Vevers and told him to basically do a head-to-toe makeover. The stock is down more than 40% this year. Kors, meanwhile, is a victim of its own success. Its handbags, watches and shoes are everywhere, and investors don't see how it can sustain its growth. The stock has fallen 11% year to date. Of course, Kate Spade stock is down as well -- about 2.5% -- but on just about every front it looks better poised for the holidays and coming year. Coach is mammoth with about 750 stores and it's having to clear a lot of old inventory. Kors has about 400 stores while Kate only has around 170, notes Kosha Gada, principal in the Retail Practice of A.T. Kearney. Related: Can this man save Coach? "Sales per square foot is the main metric for the industry, and Kate is creeping up on Coach," Gada says. Kate also has room to grow through partnerships and licensing such as its deal with Gap Kids to collaborate on children's products. It's also expanding well in Asia. Holiday in the bag? The key for all of these brands will be to have a strong holiday season that doesn't require extensive discounting. At the moment, outlet stores are driving over 60% of Coach's business, notes Robin Lewis, CEO of The Robin Report and co-author of The New Rules of Retail -- Competing in the World's Toughest Marketplace. That is lading customers to view the brand "as uncool and cheapened." Kors is on the verge of a similar problem. There's a fine line for these accessible luxury retailers between wanting to appeal to a larger population than a Prada or Chanel, but not wanting to be overexposed. "I think Kate Spade will quietly win the war. But watch out for Tory Burch," says Lewis.